Two men - one armed with a shovel - were last night chased from a shop by angry staff. Detectives are appealing for witnesses following an attempted robbery of a shop on Balmoral Link in south Belfast. 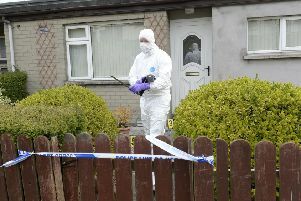 A PSNI spokesman said that it was reported that at around 7pm the men entered the premises and demanded money from staff. But the men soon made off empty handed "after they were chased from the premises by members of staff". "The males made off in a silver coloured car that was driven by a third male," added the PSNI spokesman. He said one of the men is described as being aged in his 30s, approximately 5ft 9ins tall and of stocky build. He was wearing a light grey Adidas hooded top, grey shorts with white socks and blue trainers with a white sole. The second man is described as being of stocky build with a Southern Irish accent. He was wearing black trousers and what appears to be a black football top with initials 'RT' on it and brown lace up boots. Meanwhile the man driving the car was described as being aged in his 40s, of stocky build with fair hair. He was wearing a navy, white and yellow Superdry top, navy Adidas track bottoms with a white stripe, white trainers and socks. He was described as being a stocky build and had fair hair. Detective Sergeant McCallum is appealing for anyone who witnessed the incident or anyone who has any information that can assist with the investigation to contact detectives in Musgrave Police Station on 101 quoting reference 1101 27/11/18. Alternatively information can be passed to the independent charity Crimestoppers on 0800 555 111 which is 100% anonymous and gives people the power to speak up and stop crime.